I’m reading through Measurement by Paul Lockhart these days. He presents math as something that you just need to “get messy with”. And moreover, suggests that we get messy together in asking ourselves challenging problems and developing clever arguments. Consider this an attempt at heeding Lockhart’s advice. Today I asked the following question on twitter. And, to clarify, I mean continuous, differentiable periodic functions. Your sines, your cosines. After that came a flurry of answers and conversations from all your favorite mathtwitterblogosphere partipants. @emergentmath Or how about: f(x) = cos(x) – 1 and g(x) = 1 – cos(π*x). Only equal at 0. 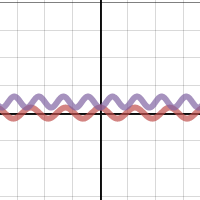 So definitely you can have a pair of periodic functions with one intersection. Initially I was wary of even this, but Joshua has me convinced. 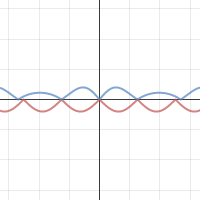 All you need is one of the periodic functions to have an irrational period (say, pi) and the other to have a rational period (say, 1) and both to be oppositely shifted vertically and the twain may meet just once. Also helpful, was this video from Joshua on irregular periods. Seeing this through the lens of rotating motion certainly helped me. It makes sense that something rotating with an irrational period will never match up with something rotating with a rational period more than once, if at all. After all, you can’t add a certain number of √2 ‘s together and get an integer. Easy peasy. f(x)=f(x+P) for all values of x and some constant P.
I’m trying to figure out how you’d make two functions meet within one period twice, and then never again. Here’s my attempt at a formal proof. g(a+c)=f(a+c) where c is some real number. g(a+c+P)=g(a+c)=f(a+c) <— third (and presumably, infinite more) solutions! I could be wrong here. I’m not particularly moved by my own argument. 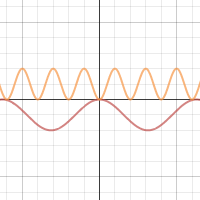 If someone finds a couple periodic functions that do intersect more than 1 but less than infinity times, let us know in the comments or share your desmos.com graph. Or even better, make a more convincing argument (for or against) than I did. Stay tuned, this post could probably get updated thanks to the collective brainpower of people that are much more clever than me. To see the functions used, click on the image. So that’s three intersections. There’s still some hesitation here and on twitter as to whether you can have additional finite number of intersections. Keep looking and “getting messy” everyone!